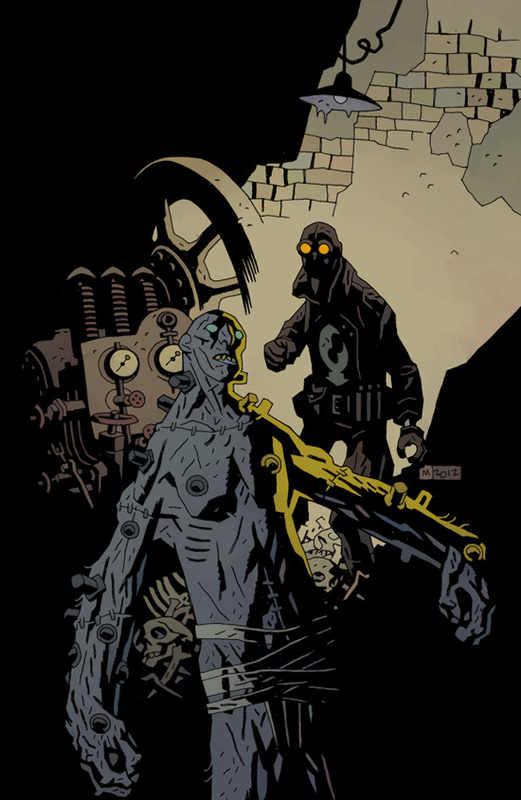 Mike Mignola’s lanky, bolt-studded Frankenstein Monster appears on an alternate cover for Lobster Johnson: Caput Mortuum. The illustration is one of the artist's “Year of Monsters” series matching Hellboy universe characters with classic monsters. Lobster Johnson is Mignola’s take on 30’s pulp heroes, a goggled, leather-jacketed vigilante battling mobsters and monsters, and branding their foreheads with his claw emblem. Though the character died in 1939, his ghost continues his crusade against supernatural evil. Caput Mortuum, a one-shot comic book, is written by Mignola and John Arcudi — a team that consistently turns out some of the best horror comics published today — with art by Tonci Zonjic. Note that the Mignola covers for this are somewhat rare, as an alternate offering to the regular covers by Zonjic. The issue hits comic book shops this week. A 3-page preview of Caput Mortuum. i really like the flatness of the colours..